I’m a musician and I play the melodeon. I had a feeling of "this is in my blood" about the Morris long before I got actively involved, with Stevenage Sword in 1976. After that there was no looking back. 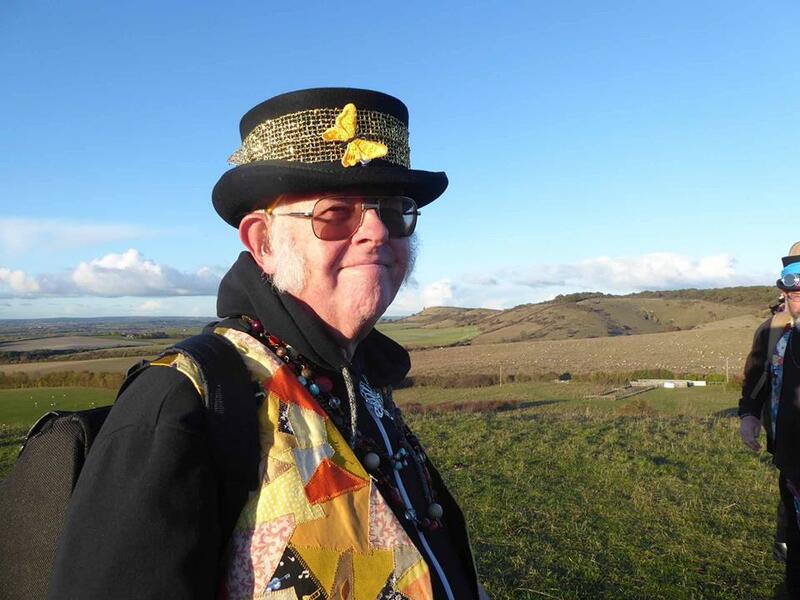 Why New Moon Morris and not another side? I don't drive, and they're local! What's your favourite thing about being in New Moon Morris? How long have you been with New Moon Morris? Since 2014, which is when the side set down roots in Ivinghoe. Headhunted by, Martin L., then Squire after he heard me playing Christmas carols with the Church choir and thought I must be a Morris musician. I wasn't really, but I'm getting there. Who are you and what do you do in the group? (Dancer, Musician - Jack of all trades) I’m Lou here, Members rep, minutes secretary and Dance lead assistant. I dance and love to play my Concertina, however l mainly dance for NMM. 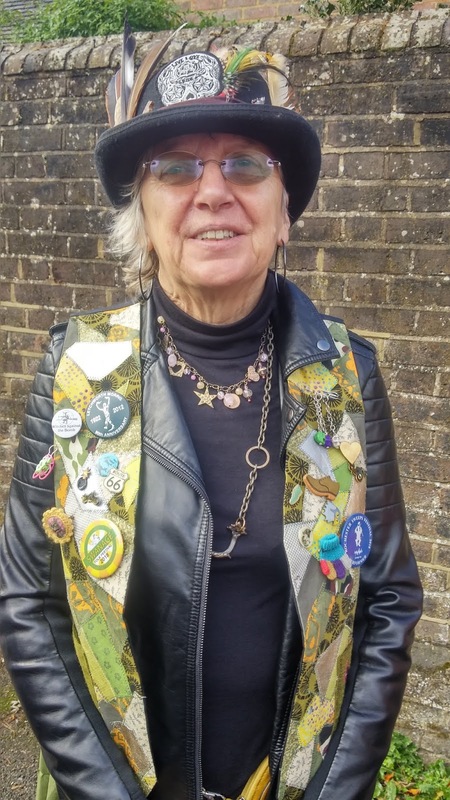 I moved to Berkhamsted and didn’t know anyone apart from Alan and Cath Fincher, NMM bagman and publicity respectively, though boating, our shared interest. l didn’t drive at the time and each Wednesday Cath kindly took me to a boaters' knit club and mentioned her Morris side needed dancers , l ignored her, until she asked me more directly would you like to try Morris dancing. Well l wasn’t thrilled at the prospect, however as Cath had been so good to me , l thought l’ll give it a go for her. When l arrived at the practice hall, l loved the music being played by Christian our lead musician on his melodeon and l was hooked. I was determined to learn an instrument to play and decided on the concertina because no one else in the group was playing one, l just had to be different! 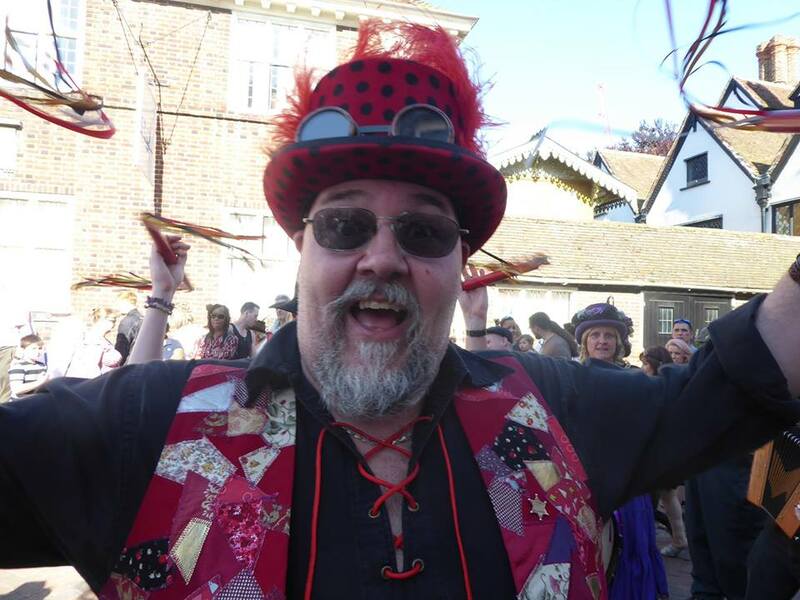 Whats your favourite thing about being in New Moon Morris? My favourite thing about NMM is all the wonderful friends, l have made, the great social side and being introduced to the world of folk music. I have been with NMM for 3 years or maybe more! Who are you and what do you do in the group? (Dancer, Musician - Jack of all trades) I like to think of myself as a dancer. 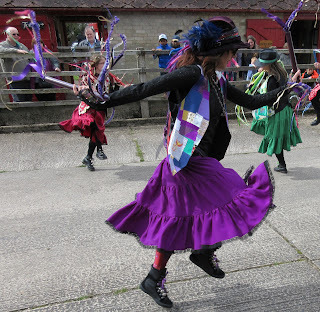 My first introduction to Morris dancing was at the village fete and I rather fancied myself in one of the fabulous embroidered skirts! I then had a go at clog dancing but sadly discovered I have 2 left feet and that put paid to that! Much much later a friend introduced me to his Morris side (Cotswold this time) and I danced with them for a while. I came across an ad for New Moon and it looked and sounded like good fun and I decided to give them a whirl! What I especially liked was their style and their dances and I decided to join them. What I especially like is their style and their dances. I have now been with them for a year! I am what I call directionally dyslexic which can be somewhat tricky at times but once I’ve got the hang of the turns (it has been suggested i should get a sat nav) then I’m ok. My saving grace is that I keep going and end up where I’m meant to be, so there! 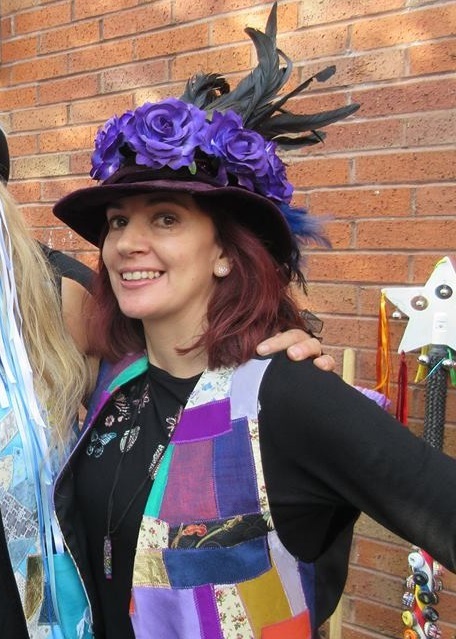 So you don’t have to be perfect to join a Morris side and if you fancy having a go with bags of fun thrown in and some good days out dancing at festivals etc then New Moon could be worth a try! Hello its me the hare again! On Friday the 30th November we bell jangling Morris lot danced at Tring Together Christmas Festival which had a terrific festive atmosphere and wonderful to see so many people enjoying the Christmas cheer. We were dancing at the crossroads in the high street with the fabulous Whitchurch Morris (with some of Towersey Morris too). It was lovely to have so many of you along joining us for some dancing, bell jangling and stick bashing fun. Tring Photographer Stephen Kitchener took some lovely photos of the Festival, you can see his album of photos (including New Moon Morris) on Facebook HERE. 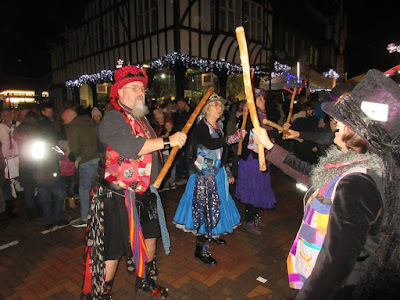 There is also an excellent VIDEO of the Berkhamsted and Tring Christmas Festivals by Roger Robinson - with some footage of New Moon performing and the Whitchurch/Towersey dancers. After dancing we retreated to the Kings Arm's for some beverages and music. For those that joined us and came down the rabbit hole thank-you. Those who didn't this is what you missed. Will you follow me down the rabbit hole next time? Who are you and what do you do in the group? 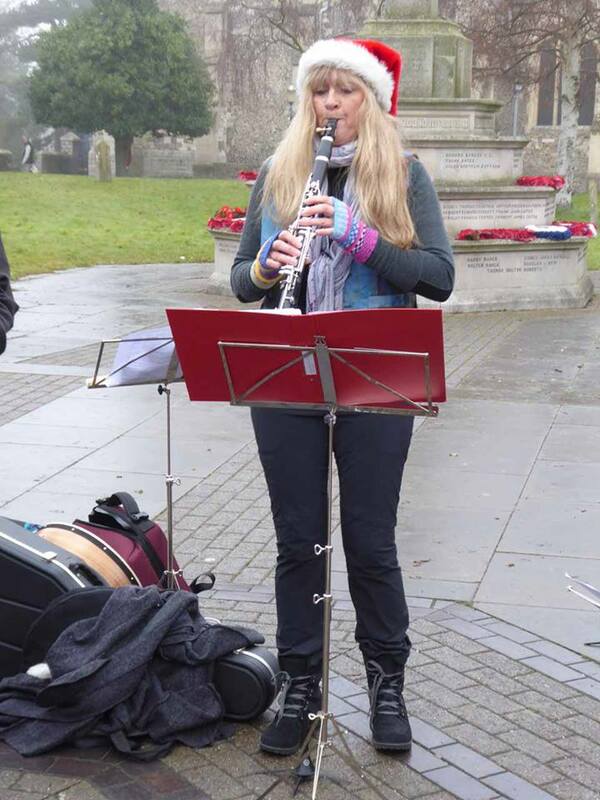 (Dancer, Musician - Jack of all trades) I’m a musician, but an inexperienced one. 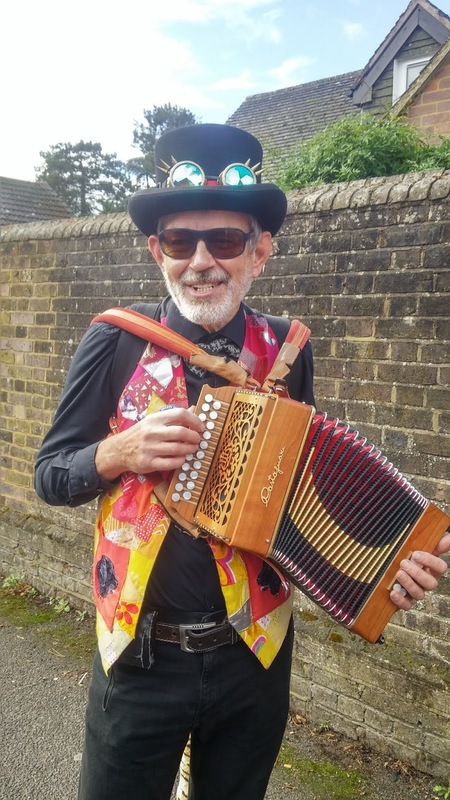 I play the melodeon, (button accordion), but only started a few years ago, with no previous musical background, so am trying hard to improve. I don’t dance – I think it would be a serious mistake to ask me! I have absolutely no idea, if I’m honest! It is not something I would possibly have seen myself involved in only a few years ago. My wife and son were already involved, and I was attending a lot of the events anyway, but not as a participant. I’ve just kind of got sucked in! NMM are a friendly and inclusive crowd, and whilst we strive for a good performance, our constitution says that having fun is more important than technical perfection. Mostly we have real fun. As a beginner musician, I’m fortunate that I’m able to take part with the support and guidance of people far better at it than I currently am. Generally I can progress at a rate that I feel comfortable with, knowing if I’m not comfortable I can drop out of any tune we are playing. Probably already covered that in the last point, but what’s special just how uncontrollably daftly grown adults can get away with behaving on many an occasion! I’m not sure when I first actually performed, rather than just watch. More than 2 years ago, certainly. I was probably ropey enough I don’t wish to remind myself of it! Already covered, I think. It’s a new side that my wife was involved in from the outset, and my son soon also got drawn into. As I was there anyway a lot of the time, trying to be part of it became more enticing than just being a spectator or taking the photographs. Why NMM and not another side? Whats your favourite thing about being in NMM? How long have you been with NMM? Who are you and what do you do in the group? (Dancer, Musician - Jack of all trades) I am the newly appointed Squire of NMM. I predominantly dance but also bang a drum and shake a tambourine. 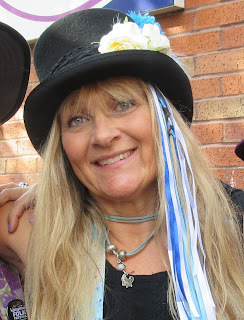 I love morris dancing it keeps me off the street and I get to meet strangely wonderful people. 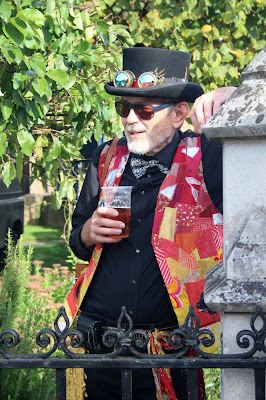 I used to dance for another Cotswold side, but I like NMM because of their vastly radical approach to morris involving dancing all different styles to all different types of music and they let me wear a kilt what more could you want. The people pure and simple. I was being harassed to join by my good friend Mr Lindridge.